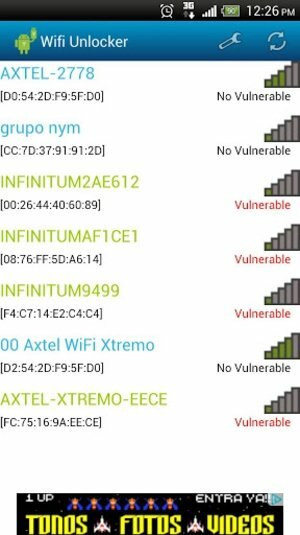 Get hold of Wifi Unlocker, an Android application that puts the security of any nearby wireless Wi-Fi network to the test. Whenever you need to obtain the keys to access any sort of router or modem, make use of this utility. 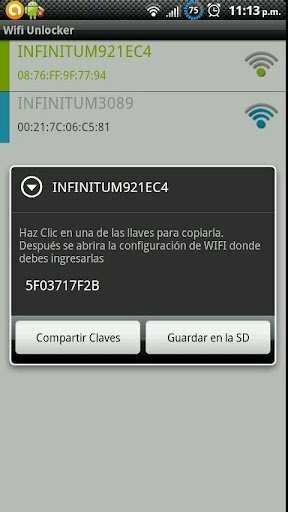 Wifi Unlocker uses different calculation algorithms for these operations. Launch the application to view the list of wireless networks within your reach, which could take a few minutes. The list will show you which networks are vulnerable and which aren't. In the case of the first ones, you can view and copy the access keys to the clipboard. Blink, SpeedTouch, Thomson, Orange, INFINITUM, BigPond, Otenet, O2Wireless, Bbox, privat, DMAX, DLink, Discus, eircom, FASTWEB-1, Alice, WLAN_, WLAN, JAZZTEL, YaCom, SKY, TECOM-AH4222,TECOM-AH4021, InfostradaWiFi, TN_private_, CYTA, InterCable, Axtel and MegaRed. Wifi Unlocker has been conceived to test the security of your own wireless network. Despite this fact, many users use it with unlawful purposes. Act under your own responsibility if you decide to download Wifi Unlocker free for Android and you want to make the most of its functions.